It’s almost that time of the year again when we turn the clocks forward and the days get a little longer and the air smells a little more fresh. I seriously can’t wait for Spring to roll around. As much as I think snow is beautiful and it’s wonderful to experience 4 seasons, I’m ready for a bit of warmer weather. I have been wearing my winter capsule for about 3 months now and all of my pieces are still holding up very well. A huge part in having a sustainable wardrobe and one that lasts longer is determined by how well we take care of the garments that we own. The fast fashion industry has created a mindset in us that feeds our desires of wanting to fit in with the latest trends and buying quantity over quality. We want to fill our gigantic walk-in closets till they are beaming with the latest styles and we have countless outfit combinations. I’m not saying that all fast fashion pieces are poor quality, but the majority of them are. However, if you have a lot of fast fashion pieces, the most sustainable thing to do is to take care of those pieces too. I still own a few pieces from fast fashion brands that are holding up well because of proper garment care. Today I’m here to share how I care for my winter wardrobe. Winter wardrobes often include things like heavy-weight knits, delicate knitwear that needs to be dry-cleaned only, winter boots, and parkas. If you take care of these items, they will definitely last you a long time and hold up for many more winters. First, let’s talk knitwear because we all love knitwear, but honestly, who has the time to bring all their delicate knits to the dry cleaners! I sure don’t and taking care of them at home is much cheaper and really isn’t as difficult as you think. It’s not as simple as throwing them in the wash and will require a bit of work on your part, but it’s worth it to keep your garments in good condition. When I first tried out the Everlane cashmere this past season, I received many DMs and comments about how I wash my cashmere and wool sweaters. It’s always a little daunting to wash those delicate pieces because I’m sure many of us have had the experience of tossing something in the wash and it coming out 3 times smaller! Story time: Growing up, one of my chores was to do the laundry, and so the first time I learned this lesson was unfortunately with one of my mom’s wool sweaters. I’m thankful for a gracious mom, but I sure felt horrible to have shrunken her sweater small enough to fit a child! Anyone else have a shrunken sweater story? Share yours in the comments below! To avoid any more shrunken sweater stories, I’ve shared step by step, how I wash my knits. Step 1: fill tub or your sink with COLD water (temperature of water is very important!) Not only is laundering with cold water better for the environment, warm water is often what shrinks knitwear. Step 2: add a few drops of your laundry detergent. Here I’m adding a few drops of Castille soap to the water. Step 3: completely submerge your sweater in the water. As gently as possible, start to agitate the sweater in the water by continuously pushing the sweater under the water and gently pressing it down. It’s important not to wring out the sweater at any point in this process. Step 4: after you have drained the water, keeping the sweater in its natural shape, gently squeeze out the water. Again, do NOT wring out the sweater. It does not have to be completely dry at this point and wringing the sweater will cause stretching in the material. Here’s a final look at my freshly cleaned and folded sweater! So what do you think? It is a little more time consuming than regular clothing that goes in the wash, but I think it’s a better alternative than going to the dry cleaners. Now to answer a few of my most FAQ other than how do I wash my knits haha! How often do you wash your knits? I wash my knits about once or twice a season. Delicate knits like wool and cashmere should not be washed so frequently as that will cause the fabric to wear down faster. I also don’t sweat that much on a day to day basis and my knits don’t get filthy dirty so they don’t need as frequent washing. How do you store your knits? I store my knits either in my chest of drawers or on stacked flat on a shelf inside my closet. Always, always, always fold your knits to avoid stretching and disfiguration. How do you de-pill your sweaters? I’ve read of many different ways to remove pilling from sweaters, however, I actually haven’t ever de-pilled my sweaters. My sweaters have not accumulated that much pilling that I feel the need to do so. The ways I’ve read about are to use a sweater comb, an old razer, or a sweater shaver. I think that frequently removing pilling from your knits may cause the fabric to wear down quicker so I would recommend only do it once every season before you wash your knits. Depending on the state of how dirty or salt-stained your boots are, my may or may not work for you. I always recommend wiping away salt stains frequently throughout the winter to avoid having to scrub tough stains at the end of a season. For boot care, I keep it fairly simple. I use a simple all-purpose cleaner that I use around the home made of 1 part vinegar to 2 parts water and a bit of olive oil to shine my leather boots. I spritz a bit of the vinegar mixture on an old rag and clean up the salt stains and water stains. I then go in with a bit of olive oil on an old rag to shine up any leather boots. These are the three pairs of boots I own and they have really been great this past winter! There honestly isn’t too much wear and tear or stains on my boots, but it’s still a good idea to clean them before putting them away in storage. My pair of short leather ankle booties (far left) have lasted me about 9 years and are still as good as new, only better because the leather has molded to my feet. Alice + Whittles rain boots all cleaned up, but will probably carry me through Spring too! 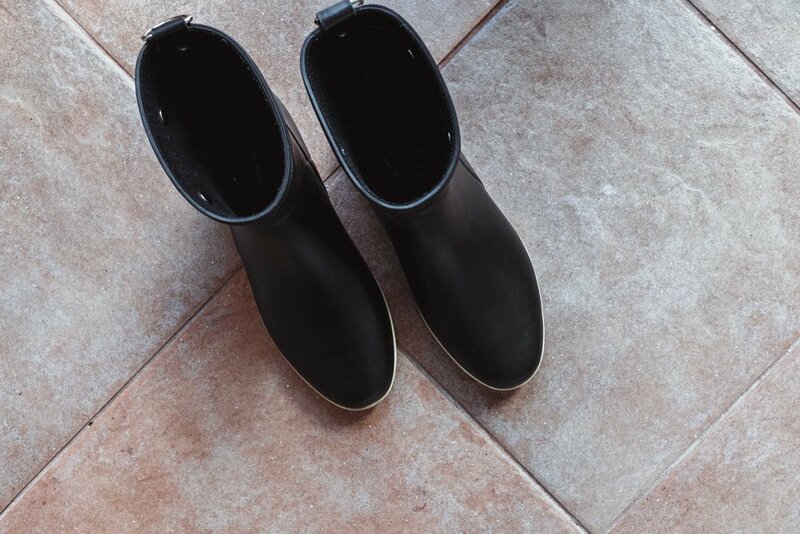 If you’re interested in a good pair of sustainable rain boots for Spring, check them out. You can use my discount code CANDICE 10 for 10% off! This past winter I mainly wore my two parkas. An old Canada goose that I’ve had for about 8-9 years now and the Everlane ReNew puffer. Similar to knitwear, I only wash my parkas once a season or once every 2 seasons. For my parka, I usually bring it to my dry cleaners unless it says it’s machine washable. I have yet to find a way to clean my parka at home. I recommend spot cleaning your outwear frequently or whenever you notice a big stain. There honestly wasn’t too much grime on my two coats and just a bit of spot cleaning and a gentle steam seemed to do the trick! Here I’ve laid out my coat on the floor to do spot cleaning. There is discolouration and some light water stains on the front pockets. After cleaning all these items, I typically store them away until winter rolls around again. For delicate knitwear, I store out of season knits in a chest of drawers. My boots are stored back in the boxes they came in or whatever shoeboxes are available often stuffed with their original paper stuffing to keep their shape. Finally, my outerwear is hung up in my closet stored with a dust bag and on a sturdy hanger. 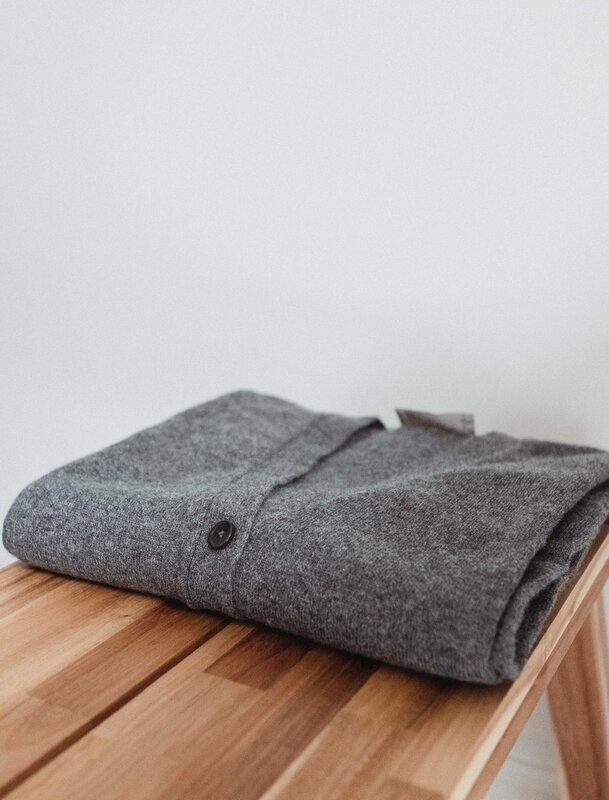 I hope this little run-down on my winter wardrobe care has helped you or given you ideas on how to better care for your wardrobe to make your quality garments last long. I really believe if you take care of your items well, they will hold up for many, many seasons. Let me know your thoughts on wardrobe care below! This post contains some affiliate links. When you choose to shop items on my blog through my links, you are supporting my instagram and blog. I only share products and brands I love and support and all opinions are my own. Thank you for supporting Candice tay!